Castelfranco has a yellowish-cream leaf with red-speckles. This beautiful, tender, lettuce-like ball unfolds like a rose. It is also known as the Edible Flower. Castelfranco is delicious served raw in a salad. It is a very mild form of radicchio. Its taste varies from slightly sweet to agreeably bitter. This radicchio is wonderful served in unique salads and appetizers. 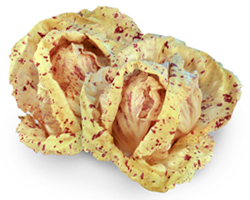 Castelfranco is a Italian winter vegetable only available November through March. And RADICCHIO SALAD tonight !! And OTHERS I’m sure !! Whenever we’re at the store !!!!!!!! P.S. HAPPY NEW YEAR !!!!!!!! PROUD to wear them !!!!!!!!!!!!!!!!! and so far? I surprised with the analysis you made to create this actual post incredible. I have discovered this wonderful salad in Switzerland and just recently found it here in Montreal. It was so beautiful I actually used it as a center piece for my dinner table.!!! world, soon after introducing it generally within the United states and U.K.